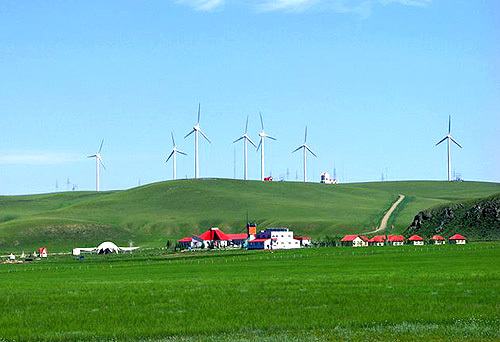 The inner Mongolia Autonomous Region lies on Chinas northern frontier. It is the longest among Chinas provinces and autonomous regions. 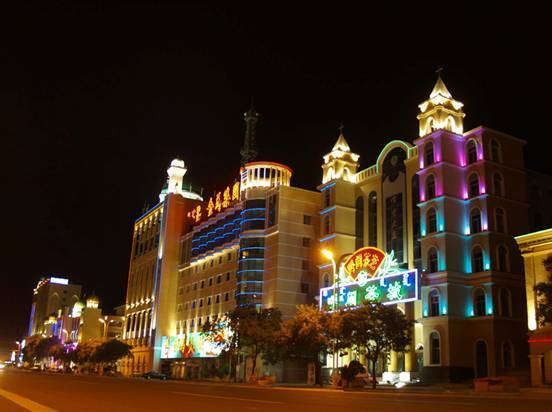 Hohhot in central inner Mongolia is the capital of the autonomous region. Hohhot means green city in the Mongolian language. 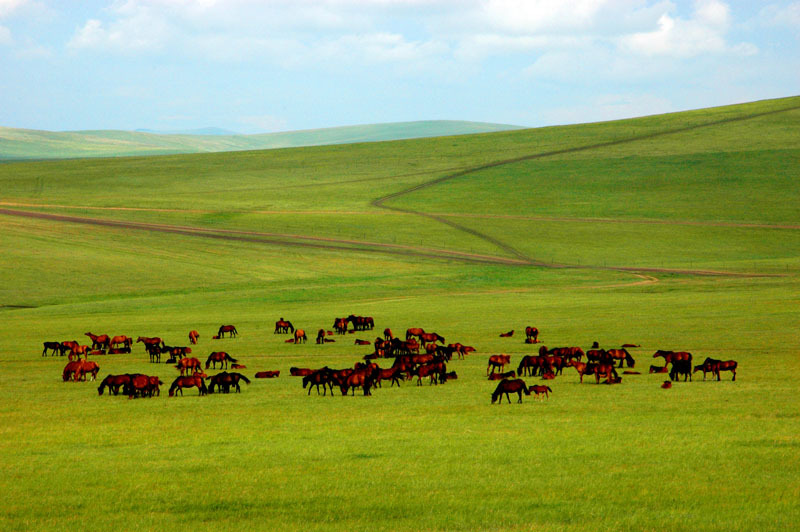 It has a population of 660,000 in its city district, who belong to ten ethnic groups: Mongolian, Han, Manchu, Hui, etc. Hohhot is a famous historical and cultural city in China. There has been settlement here for more than four centuries, since the time of the Ming Dynasty. Among the famous historical sites in Hohhot are the Temple of Five Pagodas, White Dagoba, Great Mosque and Zhaojuns Tomb. The horse race course, built in 1959 in celebration of the 10th anniversary of the founding of the Peoples Republic of China, is the largest horse race course in China. There are also the inner Mongolia Museum, Wu Lanfus Memorial Hall and the Hasu Lake Holiday Village built in recent years. To experience the life on the grassland, you can visit herdsmens house and have the local meal prepared by them. Visitors can ride a horse at a gallop or ride a camel at slow pace in the boundless grassland. In the evening, you can dance and sing with the locals surrounding the campfire. It will make your tour special and colorful. Located 100 kilometers north of Hohhot, Xilamuren means Yellow Ri ver in Mongolian language. It is also called Zhaohe, because a Lama temple (Tuzhao) was built in the Qing Dynasty near the Xilamuren River. 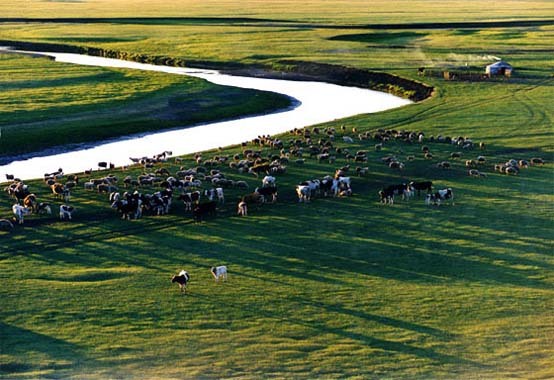 Xilamuren Grassland is the first grassland tourist attraction opened to the public in Hohhot. It is better to visit the grassland in summer and autumn because it is covered by green grass and colorful flowers at that time. 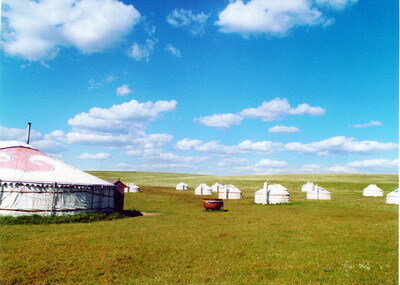 It is nice to spend one night or two here in a Mongolian traditional yurt. In the past, they were made of wood thick and furnished by blankets, low beds, quilts and pillows, which were originally designed to fold up easily then carried by camel. However, nowadays most of them are more solidly and built on yards that made of concrete. If you would like to stay in the yurts for night, you will have a true experience of being a Mongol. 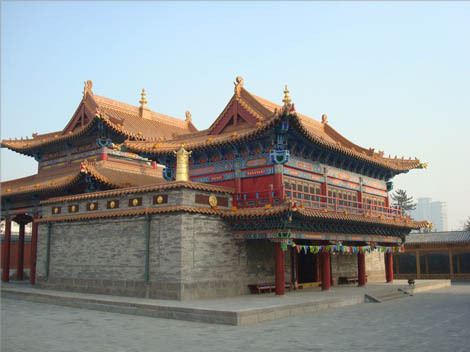 Dazhao Temple is the oldest building and the largest temple in Hohhot. It is located in the old part of Hohhot and was built in 1580 during Ming Dynasty. Usually, the locals call it Yinfo Temple (Silver Buddha Temple) because there is a rare silver statue of Sakyamuni (the founder of Buddhism) with 2.5-meter-high. Splendid statues, delicate frescos, and great collection of Buddhist scriptures, these are the major features of the temple. The central part of the temple is Fo Tang (the hall for worshiping Buddha), where the Silver Buddha lies and it has been already four hundred years. Lies in 9 km south of Hohhot and in the bank of Dahei River, Zhaojun Tomb is one of the largest Han tombs of over 2000 years. It is listed as one of top eight popular scenic spots in Hohhot. The tomb is 13,000m2 and 33m in height. It is also called Green Mound because it is surrounded by fresh and green grass. 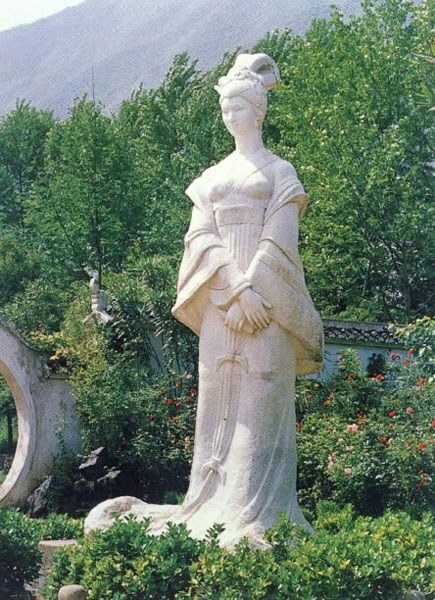 In history, Wang Zhaojun was a commoner woman of Han Dynasty and dedicated herself to the peaceful cause between nationalities. In the old times, nationalities could keep peace through marriage. In Han dynasty, Huhanxie Chanyu, the chief of the Xiongnu, put forward that tied with Han court through marriage. Then Wang Zhaojun married him. Meanwhile, she also brought the culture of Central China Plain to the Xiongnu people and promote the exchanges between two cultures. Her story spread among the people, and she was regarded as the one of the four most beautiful women in Chinese history. 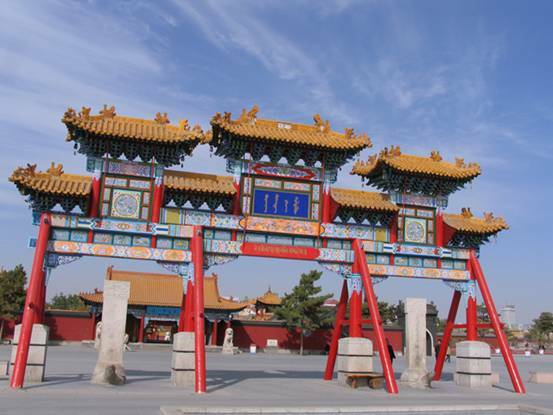 100 meters away from Dazhao Temple, Xilituzhao is the largest Lamasery in Hohhot. It was originally a small temple built in 1585, and expanded to the current scale through the reconstruction in Qing Dynasty. Xilituzhao Temple is unique mix of Chinese and Tibetan architecture. The temple was the official residence of the living Buddha since 1735. Dajing Hall (Buddha Worshiping Hall), the main building in the temple, is resplendent and embodies Tibetan style. To the east of the hall, there stands a white dagoba at a height of 15 meters carved in white marble stones. Some religious activities are held every year in the Xilituzhao Temple. Influenced by the nomadic Mongolian culture, the major food in Hohhot is mutton and wheat (buckwheat and oats). Mutton or lamb is the most famous dish in Hohhot. The common Mongolian dishes include finger mutton, roasted whole sheep, and a large varieties of dairy drinks. The most popular local restaurant is Xiao Fei Yang restaurant. Other famous Monglian-style restaurants include Bayinhaoriwa, Bayandelehai and Xinwulan Restaurants. It is a traditional and popular dish among Mongolians. People need to use their hands to pick up the mutton for eating. The mutton is cooked in the boiled clear soup with many condiments, such as, ginger, fennel, black pepper, etc. When you are taking this dish, youd better serve with the fresh soup. It tastes delicious! It could date back to Yuan Dynasty, and has been improved much at present. 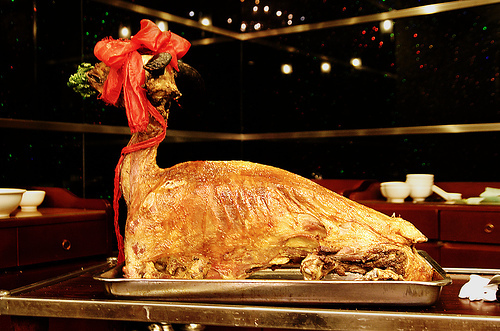 When the sheep being roasted, it is filled with spices. The condiments are mixed with flour, salt, eggs, ground pepper and so on. Then the sheep is put through with a stick and roasted on the fire or in the oven. Hohhot displays special local products from all over Inner Mongolia. These products can be bought at both fair and market, whilst special products can be bought from shopping centers. If you are interested in handicrafts such as calligraphy, chinaware, jade ware, bamboo, and woodcarvings, Inner Mongolia Antique Shop on Xilin North Road may give you some surprises. As early as in Yuan Dynasty, Mongolian have been famous for their use of silverwares. Silverwares include bowl, knife, pot and wine vessel. The silverware is finely crafted, vivid in color and traditional ethnic designs. The Mongolian bowl is a jewel among them. Inner Mongolian carpet is made of local wool, colored with mineral and plant biased dyes and hand woven. The main categories include natural-colored, archaized, Han Dynasty, and artistic tapestry. In addition, there are various cushions. Cashmere is a rare raw material for textile. Cashmere from Inner Mongolia is world famous. So is camel hair, which can be made into woolen cloth and carpet. Mongolian knife is a daily article and a status symbol as well. All will look down on a man without his knife. The blade is made of steel while the handle is made of ox horn and red wood. The Camel-shaped Mongolian knife is particularly worth mentioning. The camel body is made of redwood or birch while the handle is made from ox horn and camel bone. However, before your purchase any knife, consult with your airline as to whether knife is allowed packed in your luggage. Mongolian women learn embroidery at an early age. At about 10, girls learn to make socks and pouches. In contrast to other famous embroideries in China, the Mongolian embroidery is made on woolen felt and leather boots as well as soft materials. The Mongolian embroidery distinguishes itself by its dignified and unimposing style.